The NEC P403-AVT is a 40" edge-lit, professional-grade display that can be used in the harshest installation environments. This display has 1920 x 1080 resolution that displays incredibly clear imagery and features SPVA panel technology. The LED backlighting allows for reduced power consumption while the carbon footprint meter enables responsible use of the display conserving green gas emissions in real time. The built-in ATSC digital tuner allows for high-definition broadcast capabilities. The P403-AVT features Smart sensing technology with additional thermal protection, internal temperature sensors and fans that protect the panel from damage. The input switching speed minimizes downtime between source transitions, while the added near field communication capabilities enable easy setup and servicing. This monitor features 178° horizontal and vertical viewing angles and brightness of 700cd/m2. The NEC P403-AVT has many exciting features for users of all types. 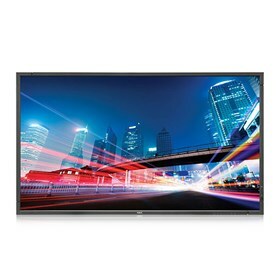 See the NEC P403-AVT gallery images above for more product views. The NEC P403-AVT is sold as a Brand New Unopened Item.